(cc) image from Chris Chan. Today’s post marks the 1,500th consecutive day of death-blogging for Executed Today. And in the spirit of marking the digital feat denoted by this sort-of round number, we thought a bonus post was in order on capital punishment’s own glorious hand — the legendary Hand of Glory. In J.K. Rowling’s The Half Blood Prince, Draco Malfoy employs a particularly grisly tool to escape from the Room of Requirement under the cover provided by a Peruvian Instant Darkness Powder: a Hand of Glory. In the Harry Potter mythos this device provides light that is only visible to the holder, making it the perfect instrument of young Malfoy’s escape. That is, assuming that he doesn’t mind carrying a mummified hand equipped with fingers that burn with a gruesome light. Many people might balk at going to such lengths, and the reader could be forgiven for assuming that Ms. Rowling was exercising a bit of literary license in order to titillate and provoke her young (and sometimes not so young!) readers’ imaginations. However, should one wish to take a trip to the charming Whitby Museum* in Whitby, North Yorkshire, England, a Hand of Glory is prominently displayed — perhaps (this is a perhaps to which I shall return later). According to the accompanying placard — though I admit I had to investigate the museum’s website to refresh my memory, as I’d not seen it in almost a decade — Joseph Ford, a local stonemason and art historian found the hand hidden in the wall of a thatched cottage in nearby Castleton in 1935. He “immediately identified it as a ‘Hand of Glory. '” In a way, it makes sense that he would do so, as it seems that stories of such hands had become quite popular in England beginning in the nineteenth century. Several books, such as Thomas and Katharine Macquoid’s 1883 About Yorkshire and Sabine Baring-Gould’s 1873 Curious Myths of the Middle Ages, described such hands. According to the authors these were instruments of the blackest magic, wrought by witches working in the darkest night. Through invocation of demons and the enactment of foul rituals, these witches created a magical burglar’s tool from the severed hand of an executed thief. It seems that such tales found the Victorian imagination of English readers to be fertile ground, as the tales were told and retold. No doubt readers found themselves deliciously chilled at the idea of burglars employing such a device of black magic, guaranteed not only to open locked doors but also to keep sleepers asleep and off their guard as those with dark designs crept into their homes. But as the title of Baring-Gould’s book would indicate, the story of the Hand of Glory had real legs. It persisted over the course of centuries and made its way across the European continent. It was not, though, quite as old as Baring-Gould would have his readers believe. magic follows heresy, as plague follows famine. We have seen heresy flourishing in Belgium and we see swarms of witches laying waste the whole of the North, like locusts. The heretics are strongly opposed by the Jesuits. This book is a weapon in that war. Therefore, descriptions of the tools used by practitioners of black magic were intended to combat the “swarms of witches” that so concerned him. These witches found instruments such as the Hand of Glory, which he describes in book two of his study, to be ideal for carrying out their plots. Del Rio’s Six Books of Magical Essays proved to be a runaway best seller, going through twenty editions between 1599 and 1755. Among the many stories it spread were those of the Hand of Glory, and soon we see stories arising of thieves making use of these devices in order to rob and plunder the inhabitants of Germany, France, and eventually, England. Sometimes there were local variations relating to their manufacture, as in German tales in which witches made the Hand from the fingers of unborn children. Nevertheless, in all the stories the Hand of Glory is demonic and its use damns to hell those unfortunates desperate or foolish enough to manufacture it. But what was the source of these tales? Isn’t it reasonable to assume that del Rio was relating stories of actual practices and that many of these practices had an ancient pedigree? Such tales were lurid and memorable … and absolutely lacking any basis in fact. (We think -ed.) Historians have given different rationales for why writers such as del Rio told and retold such stories and a full consideration of that topic would take us very far afield from our subject. Let’s just say for now that exhaustive research by the best minds in the field have shown that there is no evidence that anything like a Witches’ Sabbat ever happened, anywhere. Similarly, many of the stories del Rio told are likely the result of his willingness to pass along hearsay accounts. In fact, pretty much any tell he relates should be taken with many grains of salt — including stories of the Hand of Glory. There’s no doubt that it was a good story, but a story was all it was. Therefore, efforts such as those undertaken by the early twentieth-century philologist W.W. Skeats to explain the name as coming from the French, main de gloire, which he assumed to be a corruption of mandrake, are unnecessary exercises in verbal gymnastics. The entire reason he even made the effort was so that he could provide a “scientific” explanation for the powers of the Hand by explaining away the stories as nothing more than descriptions of hallucinations induced by ingestion of the mandrake root. 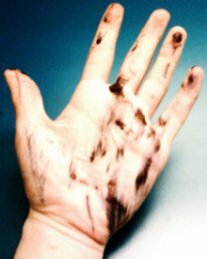 But since stories of the Hand of Glory were nothing more than stories, rather than descriptions of something that black magicians had once manufactured, there’s little need for “scientific” explanations of the Hand’s powers. 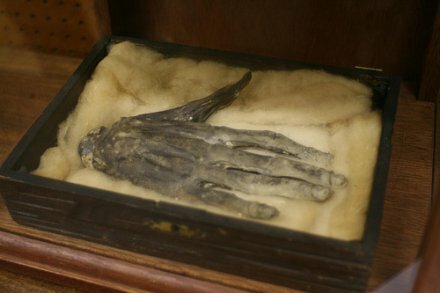 This brings us back to the Hand of Glory displayed so prominently in the Whitby Museum. According to the museum this is the only example of a Hand of Glory in existence** … yet it is singularly missing any sign of having been subjected to flames, used as a candle, or otherwise employed as a magical burglary tool. * The Whitby Museum is full of necrophernalia. ** The Walsall Museum claims to have an entire arm of glory. † As well as for bloggers. Scott E. Hendrix is an historian of medieval and early-modern intellectual history. He’s written a number of books and articles on subjects ranging from astrology to witchcraft, from riots to the history of science. He is an assistant professor of history at Carroll University and the co-editor of Rational Magic. On this date in 2009, China executed a rogue securities trader for disappearing around $10 million. 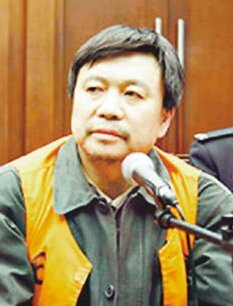 The first person executed for securities corruption in China, Yang used his position as a trader for Galaxy Securities to embezzle some 65 million yuan for personal gain. As gangster capitalists go, Yang could hardly be considered exemplary either by scale or by ruthlessness. His peculation undoubtedly harmed many people, but there’s no known whiff of violence about him; he was caught after attempting suicide. But by the same token, the occasional sacrifice of such middling malefactors potentially helps discharge some of the tension generated by the structural inequality accompanying China’s new oligarchy. What to do in such a world? “Preserve your moral integrity and don’t set too much store by business results,” Yang told a newspaper prior to his execution. You said it, brother.